J.B. Smoove revealed some pretttty, prettty good news this week in an appearance on The Rich Eisen Show. Asked about Larry David, Smoove said he likes to check in on David every couple of weeks, "because he's old." On their last call, David mention that he's "thinking about coming back" with a new season of Curb. 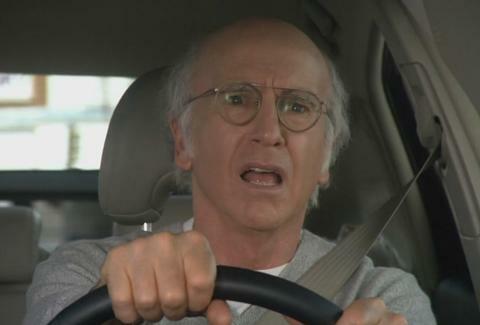 It's been a long time since Curb finished up Season 8 in 2011. They never officially closed the door on another run, but have given little more than vague nods toward the possibility of a ninth season. Fans were excited last year when the possibility was teased by Jeff Garlin, who said there was a 51 percent chance of Curb coming back. He also said, "Larry David is so goddamned rich he doesn’t have to do anything unless it’s good," alluding to the fact that even if David wants to bring the show back, it could take a while. But now that Bernie Sanders is for all intents and purposes out of the presidential race, leaving David without a presidential candidate to skewer on SNL, there's some renewed hope that everyone's favorite misanthrope could return for some new adventures. "He starts off with his little, 'Ehhh, you know, I'm thinking about coming back,'" Smoove told Eisen. "But see, that's great because he has not said no, which puts us in a great position for possibilities...that means it's still going. "If Larry does not say no, there's a possibility he may say yes. And then he went extra. He said, 'If I do come back, would you be available?' I said, 'You know something Larry, I'll be available. just call me, give me early notice, and I'll be there.' I'll move anything to the side for Curb Your Enthusiasm, which would be a fabulous thing to do. Season 9 would be fabulous." It's far from a guarantee, but it's the best news Enthusiasm enthusiasts have had since the end of Season 8. Maybe it's more like 55 percent likelihood now. 54? Or maybe this whole situation turns David off of doing the show entirely. We know what he thinks about people who wear sunglasses indoors.